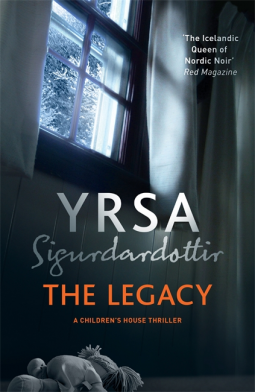 The Legacy is my first venture into Icelandic Noir and the first in a new series by Yrsa Sigurdardottir – the Children’s House thriller series, translated from Icelandic by Victoria Cribb. I think the first thing I should say about this book is that I loved it and once I started reading I just didn’t want to put it down. What is so remarkable about that is that there are some particularly dark and nasty murder scenes, which would normally guarantee that I’d stop reading. I am so glad I did read on. The Legacy is an excellent book. It’s dark, mysterious and very cleverly plotted, full of tension and nerve-wracking suspense. Although I thought I’d worked out who the murderer is I was completely wrong, but looking back I could see all the clues are there, cunningly concealed – I just didn’t notice them. It begins with a prologue set in 1987 when three young children, two boys and their little sister are waiting to be adopted. It’s hard to find anyone willing to adopt all three and they are separated. The psychiatrists’ opinion is that it is in their best interests to be parted and that their horrendous background be kept secret, hoping that time and being split up would obliterate their memories. I did try to keep the events in the prologue in mind as I read and had some idea of how it related to the rest of the book, but it was only when I came to the dramatic conclusion that everything became clear. Move forward to 2015 to Elisa whose husband is away leaving her on her own with three young children for a week. Her seven-year old daughter, Margrét wakes her, frightened because there is a man in the house. What follows is the first horrifying murder (read it quickly and try not to linger over the details because the pictures they paint don’t bear thinking about). Margrét, who was hiding when her mother is killed, is the only witness and she’s too traumatised to say very much. She is taken to the Children’s House where Freyja, the child psychologist in charge and the detective Huldar, in charge of the police investigation, try to get to the truth. It’s immensely difficult, complicated by more murders. Freyja and Huldar are both sympathetic characters, both deeply committed to their jobs, but because of past history between them unable to trust each other. The narrative is in the third person and switches between Freyja’s and Huldar’s viewpoints, interspersed by that of another character, Karl a student and radio ham enthusiast who has been receiving strange messages from a mysterious numbers station broadcasting, unusually, in Icelandic. These consist of long strings of numbers read out by synthesised voices. Karl dreams of successfully cracking the codes. I was both intrigued and completely mystified by this part of the novel. I was completely engrossed in the plot and the characters and I shall certainly be reading more of Yrsa Sigurdardottir’s books in the future. My thanks to the publishers, Hodder and Stoughton, for an e-book copy for review, via NetGalley. This sounds rather good! I’ve read one book by Yrsa Sigurdardottir, Last Rituals, which I enjoyed but for some reason I didn’t read any more. Just checking Fantastic Fiction for the name of the book I’d read, I discover the author is a woman… I thought it was a man! I’m so glad you liked this so much, Margaret. I like her writing very much, myself, and this sounds a very promising series.